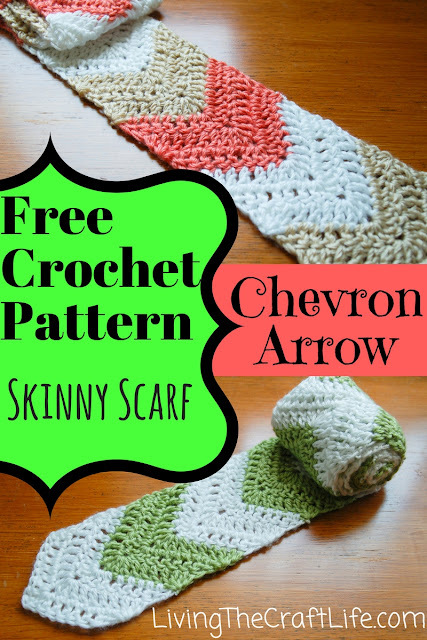 Isn't chevron so HOT right now?! So is the miniature version of chevron... the Arrow! 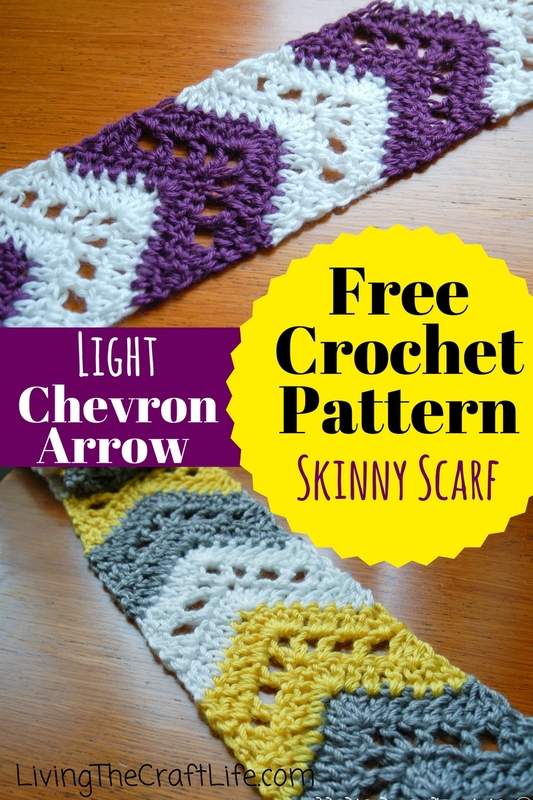 I know there are many patterns for chevron scarves, but I was disappointed that so many of them were entirely single crochet. I also had a hard time finding one with sharp peak like mountains (versus small hills!). I put together this pattern so you can make chevron or arrow scarves FAST! Not essential, but approximately 4"x60"
Dc2tog: (Double Crochet 2 together)- yarn over, insert hook into first chain, yarn over, draw yarn through stitch, draw yarn through 2 loops on hook, yarn over, insert hook into second chain, yarn over, draw yarn through stitch, draw yarn through 2 loops on hook, at this point you should have 2 partial double crochet stitches completed, and you should have 3 loops on your hook), draw yarn through all 3 loops on hook. Dc3tog: (Double Crochet 3 together)- yarn over, insert hook into first chain, yarn over, draw yarn through stitch, draw yarn through 2 loops on hook, yarn over, insert hook into second chain, yarn over, draw yarn through stitch, draw yarn through 2 loops on hook, yarn over, insert hook into third chain, yarn over, draw yarn through stitch, draw yarn through 2 loops on hook (at this point you should have 3 partial double crochet stitches completed, and you should have 4 loops on your hook), draw yarn through all 4 loops on hook. 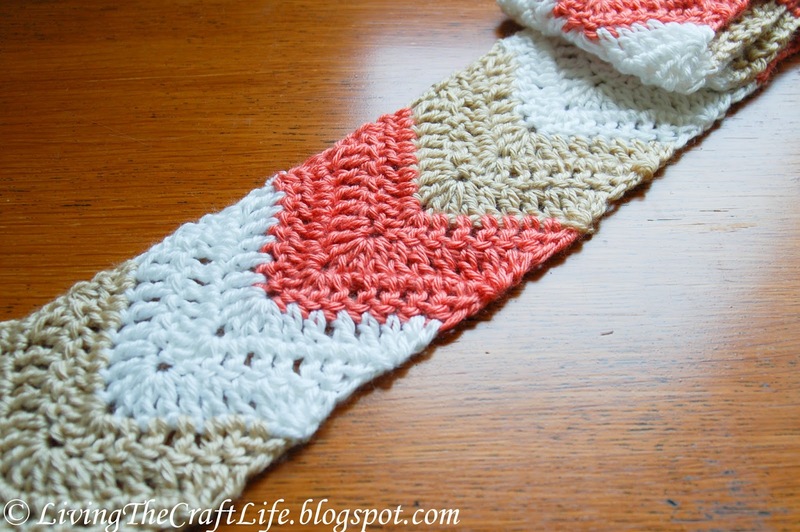 Scarf is worked in rows. 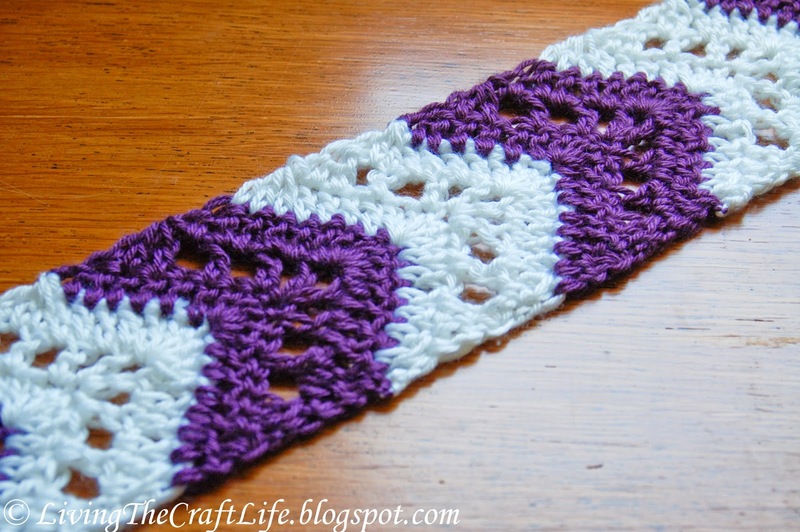 The turning chain counts as the first double crochet, therefore you do not work the in the very first stitch of each row. That first stitch counts as the space the turning chain is worked in. 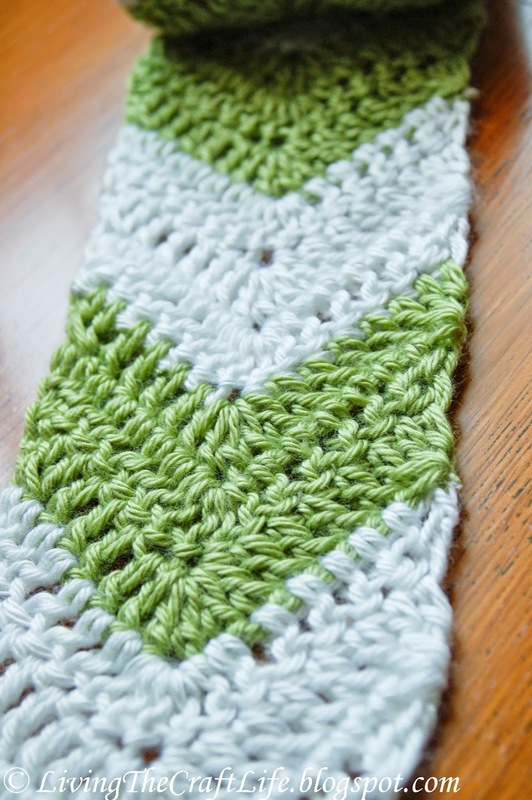 You may attach new colors at the beginning of any row, and each chevron block can be as big as you desire. In the samples I photographed I did 3 rows for each color block. 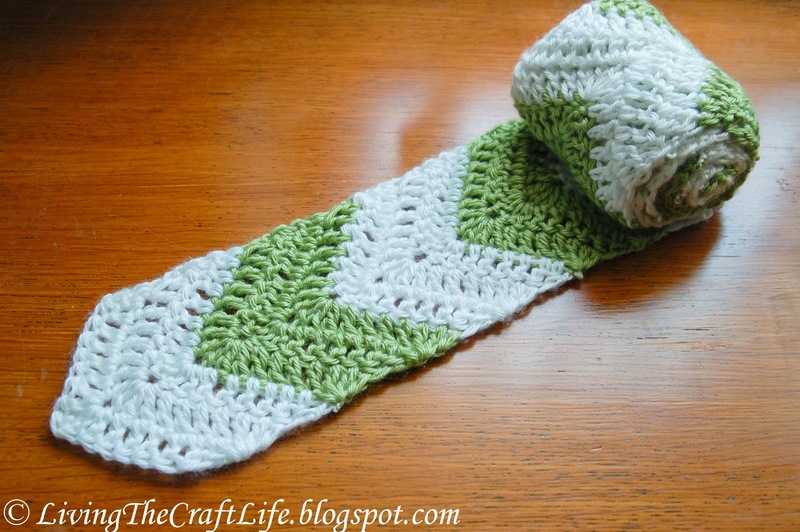 The first row is a beginning row that starts the chevron pattern, and after that you can do either the solid chevron or light chevron row patterns for the remainder of the scarf. Row 1: dc2tog in 3rd and 4th ch from hk, 1 dc in next 4 ch, 5 dc in next ch, 1 dc in next 4 ch, dc3tog in last 3 ch, turn. Row 2(solid chevron): ch 2 (counts as first dc), dc2tog in next two stitches, 1 dc in next 4 ch, 5 dc in next ch, 1 dc in next 4 ch, dc3tog in last 3 ch, turn. 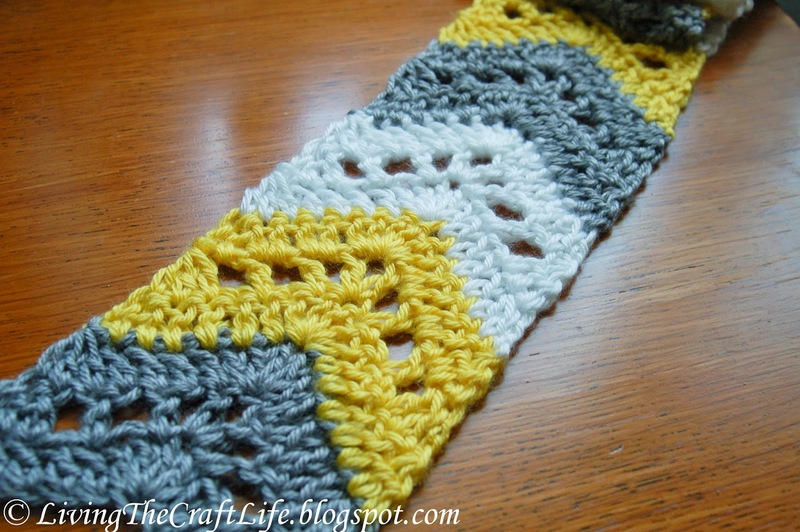 Repeat row 2 to make solid pattern scarf. Alternate colors as desired. Finish off when you have reached your desired length and weave in ends. 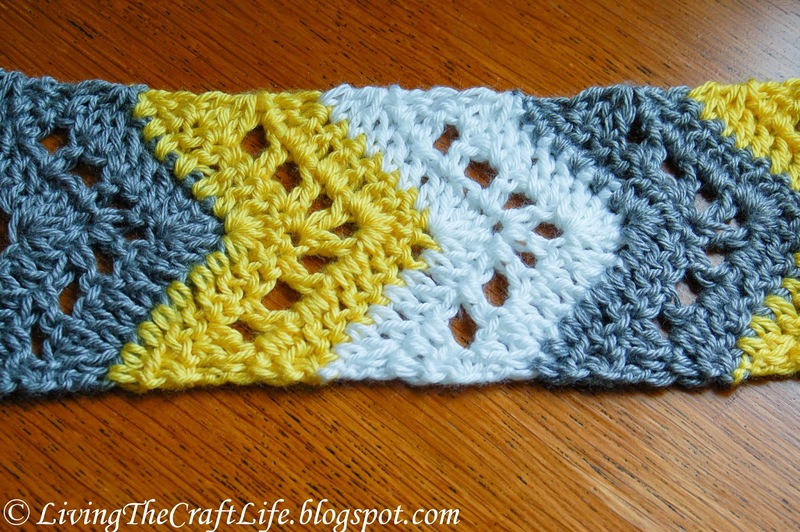 Light chevron row pattern: ch 2 (counts as first dc), dc2tog in next two stitches, sk 1, ch 1, 1 dc in next st, sk 1, ch 1, 1 dc in next st, ch 1, (dc, ch1, dc) in next ch, ch 1, 1 dc in next, sk 1, ch 1, dc in next, sk 1, ch 1, dc3tog in last 3 ch, turn.